What does “Punching snakes” mean? Michael Abbott of The Brainy Gamer blog wrote on Sunday about the need for critics to “let go of our preoccupation with gameplay as the primary criterion upon which to evaluate a game’s merits,” and to “stop fetishizing mechanics as the defining aspect of game design.” As someone who has fallen on the side of seeing video games mostly as narrative experiences in the present day, I still have to disagree with Abbott’s argument. Games are, at their heart, a set of rules and mechanics, and everything else is a modifier to that base definition. Abbott’s example of Tertence Malick’s film Tree of Life failing on the technical level but still being brilliant when viewed holistically doesn’t feel apt. Film, at its best, is about conveying character and emotion as a primary goal. Film can afford to suffer technical errors as long as the primary goal of the medium is accomplished. Video games, at their best, are about providing solid and engaging play. Play is about rules. Rules are enforced by mechanics. Video games therefore have far less leeway than film in the technical errors they can support before the end product is critically flawed. Video games can afford to suffer some modicum of technical errors and still be playable – we routinely look past the regularly-scheduled bugs in Bethesda titles all the time without letting them ruin our fun – but if their mechanics are so broken so as to preclude play? Without play, there is no game, at which point nothing else matters. I think the salient aspect of Abbott’s post starts midway through, when he expresses his frustration with the term “video game.” Rather than trying to redefine what the term means, in order to fit everything inside the same, comfortable box, however, I think we need new language entirely. Our problem isn’t with the meaning of the words we have, but rather the lack of anyone trying to make up NEW words. I agree that trying to call anything with input devices and digital art “a video game” has officially become ridiculous. Much of what Jason Rohrer produces is not, in my mind, a video game. Passage is a piece of digital art that borrows elements from the video game form in its expression, but it is not a game because there is no winning or losing. I might argue that The Sims has never been a video game, for the same lack of victory conditions. It is a simulation, a digital sandbox, and winning or losing has nothing to do with it. When competition ceases to be part of the equation, I think an object’s definition as a game should immediately be called into question. We don’t do this because even if we determined that “video game” no longer works as a descriptor, we have no fallback positions or options available. The need for new language seems pressing. We can define what a “video game” is quite well, I think, and it will be an apt definition the vast majority of the time. Rather than trying to bend that working, functional definition in order to fit objects that may not belong in the set, why don’t we create new categories of objects? 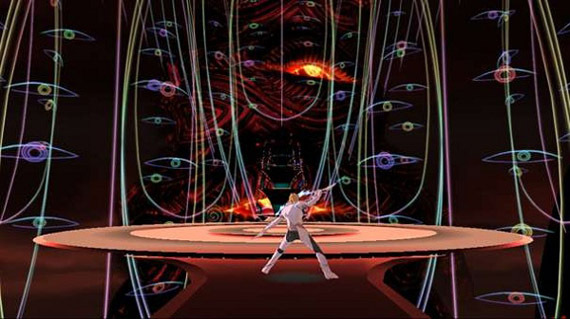 Abbott’s concern seems to be that El Shaddai is being treated like a video game more than some other form whose aesthetic criteria might be more appropriate. When I demo’ed El Shaddai at PAX East it sure felt like a game to me, and the platforming was horrible. If this wasn’t addressed between my preview and the release, then I think that’s fair game for criticism…and if El Shaddai didn’t want to be judged on that criteria, perhaps its creators should have used the same art aesthetics and made an animated film out of them, instead. Even though I love video games for their narrative and artistic potential, adding that dimension to the mechanics that used to be the medium’s sole characteristic doesn’t excuse a video game with those narrative or artistic pretensions to drop the ball on the basics. One might argue that the greater a video game’s narrative or artistic inclinations, the more important its mechanics become. If the audience can’t navigate the digital world smoothly enough to forget about the existence of the mechanics at all, if they can’t reach a state of flow, doesn’t that impediment leave the audience unable to entirely appreciate the story or aesthetics due to the constant mechanical interruptions and frustrations? How brilliant would anyone have found Braid if mechanics like jumping and smoothly climbing and detaching from ladders, i.e. basic platforming mechanics, didn’t work properly? Where I agree with Abbott absolutely is in our need to view games holistically. Mechanics are not the end-all of appreciating video games, but asking critics to divorce such a defining characteristic from our appraisal of the medium seems untenable to me. The better course of action is to help identify and define new genres and forms for creators to work in which are similar to, but different than, video games, such that said creators have the choice to focus on design aspects they are interested or skilled in, without the burden of also having to deal with the aspects they aren’t. Dennis, September 12, 2011. 2 Comments on Games ARE Clocks. Category: Posts. tree removal on What does “Punching snakes” mean? granny horror game online on What does “Punching snakes” mean?